This summer sees the first Olympic Games to take place in South America, with more than 10,000 athletes heading to the purpose built Olympic village in Rio de Janeiro. Despite being the first Games held in the country, it is not the first time the city has hosted a major sporting event of this scale, with the 2014 football World Cup final being held there, in the Estádio do Maracanã. The influx of people to a Games is simply staggering. London 2012, for example, saw 10,568 athletes competing from 204 countries. According to reports, more than two million people attended the Games’ first three days of events, with 698,000 people flying or taking the Eurostar into the UK specifically for the event, and with 277,000 of these coming from beyond Europe. Add to this the millions of British-based attendees from outside London, plus the 70,000 volunteer marshals, and you have a recipe for traffic chaos on the roads. Organising an Olympics is therefore no mean feat. The London Games were cited by many as hosting the best modern Olympics – and not just by those with a vested interest, but also by those who gave the title begrudgingly; The Australian newspaper, for example wrote: ‘As awful as it is to admit, London 2012 was bigger, slicker, almost as friendly and more thoughtfully planned than Sydney in terms of the legacy it will leave the host city.’ Still, in the run up to the Games, almost everything seemed to point the other way, from problems on the venues’ ticket gates (the Army needed to be drafted in at the last minute when G4S pulled out), to feared traffic gridlock (more than a quarter of Londoners planned to leave the city during the event, reported The Telegraph), and airports coming to a standstill (airlines, from BA to Virgin, predicted chaos unless significant changes were made for the Games). So how can vision systems help a city cope with such huge influxes? Stephane Clauss specialises in intelligent transportation systems for Sony’s Image Sensing Solutions division. He described a number of key areas where a host city would need to invest in technology to manage the sheer volume of people – as well as the security – to keep transport networks flowing: at the airport, managing both the influx of passengers and the terminal security; on the roads, to both ensure safety for travellers and direct locals around the traffic as quickly as possible; on public transport, to monitor passenger numbers, and ensure it runs at peak capacity for as long as possible; and at the venue, to speed the identification and ticket validation process at the gates. 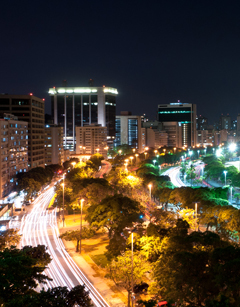 There are several challenges for vision systems monitoring traffic, such as preventing car thefts from event car parks, keeping tourists safe on Brazil’s roads by ensuring vehicles are road-worthy, and keeping high security areas protected by detecting stolen vehicles from those flagged on an alert list. Brazil has among the highest car-theft rates in the world, ranking 34th out of 34 major economies examined in 2012 by the Israeli security firm Secured By Design, with 140 of every 10,000 vehicles stolen. Allard Blom, COO of the automatic number plate recognition (ANPR) systems developer Abstract Computing, remarked that, while many car parks require a printed card to exit, it’s still very easy to drive in with one car and out with another, more-valuable one – especially as those attending the events will leave their cars for a predictable duration. But, for the Games, each exit happens at a predictable time, meaning it’s possible not only to use ANPR to ensure the same vehicle entered and exited on a given ticket, but also to allow this only at set times. Vision systems are also being deployed to ensure vehicles are road-legal, with one such system from Brazilian ANPR firm FiscalTech. The company’s technology includes RVG-Speed Control, which embeds a high resolution camera, a laser speed detection system, 3G, 4G, and WiFi wireless connectivity, GPS location chips, and a fast on-board processor to handle image recognition algorithms that extract not just number plate data but other information, including car colour and car type. The handheld scanner is one of the smallest on the market and is able to monitor up to four lanes simultaneously, giving information on traffic volumes, speeding infringements and the detection of vehicles that are either known to be stolen, non-roadworthy, untaxed or those with false plates. By running an embedded character recognition system, the device is quick enough to identify offending vehicles automatically and transmit the data to nearby patrol vehicles. An alternative approach comes from the UK firm NDI Recognition Systems; the company’s Ring of Steel solution has been running in London since 2002, and more recently in Manchester, to protect high-risk targets such as Buckingham Palace and the Houses of Parliament, and was operating during the 2012 Olympic Games (Rob Coppinger wrote about the NDI system in his article on security for the London Olympics for the April/May 2012 issue). NDI-RS uses its C3 Series ANPR cameras, which combine a Sony block camera running the Exview HAD CCD sensor with a wide-angle, 18x zoom lens and 3G wireless connectivity and 1.35GHz ARM processor. Since 2002, the pole-mounted ANPR camera network has been expanded and today there are around 100 fixed sites deploying more than 500 C3 Series ANPR cameras, which in turn feed back to processors located at various points in London. The system captures 600,000 number plates each day and automatically checks each against the Police National Computer, DVLA and local police intelligence databases, instantly triggering alarms on vehicles involved in crime. But ANPR isn’t just for security; it can also be used to reroute locals eager to avoid congestion caused by the Games. Abstract Computing has developed systems that use ANPR technology to identify cars on different routes and inform drivers via digital signs on the motorways, all based on its ScanaCar technology. According to Blom, the cost of building such systems has come down significantly in recent years as many cars are now integrating Bluetooth wireless technology to communicate with phones. ‘Every car that uses Bluetooth sends out a unique identifier and you can use this in the same way that you match the license plate. [But] you can’t detect everyone with Bluetooth; the detection rate drops to 70 per cent, which is more than enough to do the matching on routes, but it’s not enough to give information on the number of cars passing.’ So by using ANPR cameras for confirmation at key points, and Bluetooth sensors along the route, a very accurate picture can be built. Abstract Computing has previously developed systems to track faces through the arrival halls of a major Dutch airport. As Imaging and Machine Vision Europe reported in 2010, tightened security, which would accompany the influx of passengers for the Games, ‘might be necessary, but it can lead to longer queues and greater disruption for travellers’. At the same time, standard video analytic techniques are inappropriate for counting people in this scenario, as baggage would cause a lot of false-positives and disturbance in the data with cameras looking horizontally. Abstract’s system installed in the Dutch airport (ScanaLane) used Sony smart cameras to provide airport personnel with real-time information on the volume of passengers moving into the 25 x 50m arrival hall containing 12 lanes. The cameras, installed above each of the lanes, look horizontally into the faces of the queuing passengers and conduct face detection, running Abstract’s ScanaFace software, to count people passing through and monitor how long individuals remain in a queue. If there is an influx of people from an incoming flight, airport staff can act on the data supplied by the system to add staff and communicate potential issues more effectively. The rapid increase in video resolutions have also helped to speed this, with Sony’s Clauss commenting that Sony’s customers are creating applications that deliver biometric recognition based on the company’s 4K FCB camera, which delivers 8 megapixel images at 30fps. This means the high resolution image held digitally for the passport, along with additional biometric information, can be compared with the person standing in front of the camera. And provided a suitable image – ideally several in various lighting conditions – has been taken, a high resolution camera with high sensitivity and wide dynamic range will create an image that can be compared digitally with the original on file, even in the gloomy lighting conditions found in immigration halls. Abstract’s Blom also highlighted the importance of using vehicle ANPR in high security areas, such as outside the airport. Abstract’s ScanaCar cameras scan two lanes at a time and use the Sony IMX174 sensor, chosen for the wide dynamic range and light sensitivity. This camera is coupled with a communications system, typically 4G, to communicate with the attendants and security staff, and check databases. Clauss noted that biometric images, for iris scan, facial recognition and fingerprint, can all be combined to prevent ticket counterfeiting; however this also slows down the processing at the venue gates. As with passports, image quality is everything, and therefore the camera needs to be capable of creating very large pictures with high frame rates. Furthermore, the venues will vary significantly in terms of lighting, with some events – for example the rowing – taking place at outdoor venues that have changing light conditions, while others – for example weightlifting or gymnastics – are often held in gloomy halls. Clauss stressed that a wide dynamic range and high sensitivity is essential, referencing the company’s FCB-ER8300 camera block, which uses a 1/2.3-type 4K CMOS sensor to take 3,840 x 2,160 pixel images at 30fps with a 12x optical zoom. Rio de Janeiro’s English language paper, the Rio Times, has said that public transport is likely to be the key legacy of the Games for the city. The city, which is very reliant on an over-congested road network, is spending billions to develop its rapid transport network and extend its metro system. Again, vision systems can play a key role in keeping the metro system safe by controlling passenger numbers entering the stations at peak times, and running well by ensuring the identification of required maintenance work is automated to reduce closed lines. walk the track each night and this caused long-overnight closures. And while the Underground had an inspection vehicle, it only ran at night. ‘The recording is fairly simple; the big challenge is coping with the vibrations and the electrical spikes [from the high-voltage third rail].’ The system created by Stemmer Imaging has an inspection camera attached to a train’s undercarriage, with one train per line (11 in total) carrying the camera. These attach to the undercarriage, with no suspension. 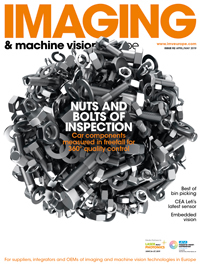 Stemmer Imaging used the high-vibration Genie TS camera from Teledyne Dalsa, coupled with an IR strobe light. As for the next generation of apps that could be deployed for the 2020 Games in Tokyo and beyond? Sony’s Clauss said the company is working with integrators to deploy a network of cameras that can recognise and track people in a subway network. ‘So when you enter the metro station you will be identified, and then all the cameras are linked together and the software is able to track you through the system.’ According to Clauss, these are not only very demanding applications that push current limits of the camera, but large stations – such as London King’s Cross or Paris Gare du Nord, with their multiple entry points and crossing corridors – require an exponential increase in the number of linked cameras – and therefore of processing capabilities.